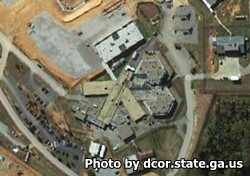 Clarke County Correctional Institution is located in Athens Georgia, part of Clay county. It is a medium security institution that confines approximately 112 adult male felons. Inmate quarters are an open dormitory setting. Inmates who are difficult to manage or have safety concerns are housed in segregation cells, which are separate from the general population. Inmates incarcerated here work in supervised positions within the county government, including providing maintenance and labor for the police academy, the Georgia State Police and other agencies. Offenders can also take courses to earn a GED, and receive counseling for alcohol and drugs. A re-entry program at this facility helps prepare inmates for their release. We do not currently have the visiting hours for this facility. If you know the visiting hours for this institution please help us and others out by leaving a comment below.